Carl Dethlefs and Sons maintains one of the best sources of quality 2-yr old registered virgin Angus range bulls in Nebraska. Carl Dethlefs and Sons received the Historic Angus Herd Award recognizing 50 years in the Angus Association in March of 2001. In 1950, Carl purchased his first registered Angus cattle cows. Carl joined the American Angus Association in 1955 registering his herd as Carl Dethlefs and Sons. In 1965, his son, Jerry, joined Carl in a partnership. They were partners until Carl's death in 1986. Jerry's son, Gary, formed a partnership in 1987. 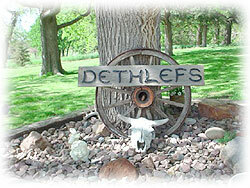 Jerry and his wife, Dianna, Gary and his wife, Dar and their family are the current owners of the Carl Dethlefs and Sons herd. Their ranch is located in central Nebraska along the Middle Loup River between Rockville and Loup City. Daughters, Carol and Tracy and their families also retain an interest in the cattle. The Dethlefs have been involved in performance testing since the 1970s and 1980s. They were yearly consignors at the Western Nebraska Bull Test Station in Ogallala, Nebraska. During that time, they had several top gaining bulls and sire groups. Performance, growth, and efficiency continue to be their goal. They have also consigned bulls at the Midland Bull Test Station in Montana. In 2003-2004 they had the Champion Actual Weight Per Day of Age Gaining bull. The test consisted of bulls from some of the top herds across the United States. Of the bulls they consigned, they averaged .25 more pounds of gain per day than the average of the entire 585 bulls on the test. In the era when the seed stock industry has been accused of forgetting about "lean gain" and "actual muscle", the bulls averaged 14.00 square inches of rib eye, or 1.23 square inches per 100 lbs. of body weight at the 1142 lb. scan weight. In the 2005-2006 Midland Bull Test, a Carl Dethlefs and Sons bull placed 3rd out of 685 head of Angus Bulls in the Weight Per Day of Age Average Daily Grain contest. Our bulls are weaned in mid-October and grown on a high roughage ration designed for a 2 to 2 1/2 lb. of gain per day until Spring. These bulls remain on pasture with minimal supplementation during the summer and fall and will be kept in the pasture until the time of the sale. The bulls will get plenty of exercise and will be in the right condition to go home and work for the cattlemen. Artificial insemination has been used quite extensively in the herd. They have been doing embryo transplants since 1987. Hard work and honesty are just as important today as when Carl started this operation over 50 years ago. We expect the same from our cattle. Our cows must be fertile, calve unassisted, raise a heavy calf, and survive the same way any commercial cow herd does every day. Because of the intense competition in the cattle business, it never has been more important to use the best genetics available.